#238. 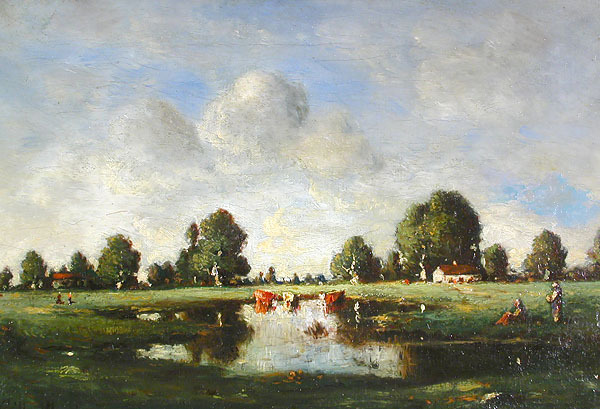 Cattle in Pasture. 10 x 15, oil on canvas. "Gilbert Munger" lower left. In a private collection in Saratoga Springs, NY, from which it was sold for $2,500 + 10% at the Woodstock (NY) Artists Association Apres Ball Fine Arts Auction, 5 September 2004, lot 137. Subsequently sold by Art & Antique Gallery, Worcester, MA, at the Miami Antiques Show, 20-24 Jan 2005, to a Sharpsburg, MD, collector. Image from digital photo provided by the James Cox Gallery in Woodstock, NY.